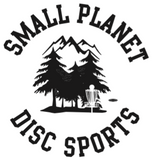 What is Disc Golf ? The Discraft Weekender Bag is quality gear at an affordable price. Holds 6-8 discs, with putter pocket, padded shoulder strap, bottle pouch, inner zip pocket, zippered and velcroed rain cover. This product is warranted against manufacturer's defects in materials and workmanship. Great little bag for when you are just starting and only have a handful of discs (I can squeeze my 7 discs in). Has an inside zip up pocket for holding keys, phone, etc. An outside sleeve / pocket for scorecard and pen. Comfortable shoulder strap. Zip up & velcro main flap for quick access to discs. Only slight negative is the drink holder pocket on one end is only good for fitting a small bottle.